Sciblogs | Crunch time in Bisphenol-A "debate"
Crunch time in Bisphenol-A "debate"
Debate in scientific, political and business circles has raged for years over whether Bisphenol-A, a chemical used to line everything from drink bottles to tins of fruit can have harmful health effects on children and adults. UPDATE: Audio of Professor Gordon Robertson’s presentation on the science of food packaging hazards available here. With countries around the world taking confusingly different approaches to BPA – (some have issued partial bans on it, others maintain it is completely safe), the vexed arguments around BPA may be about to come to a head as European and US food safety regulators look to update their advisories on it and scientists progress the most thorough studies to date into BPA. The BPA issue occupied part of a fascinating presentation in Auckland today (I’ll post the audio shortly) at the New Zealand Food Safety Authority conference, where Queensland University’s Professor Gordon Robertson, an expert in food packaging, explained the split in thinking on BPA in the scientific community. Perhaps more importantly, he outlined several food packaging chemicals and techniques – from recycled paper packaging to the ink used on food labels, that don’t get the headlines in the same way BPA does, but whose impact on food and human health are poorly understood by the industry creating them and the scientific community in general. Sometimes the results seem downright weird, indicating that low doses could be worse than higher ones. There is sharp disagreement among scientists about how to interpret some research. The disputes arise in part because scientists from different disciplines – endocrinologists versus toxicologists, academic researchers versus those at regulatory agencies – do research in different ways that can make findings hard to reconcile. If Bisphenol-A was a purely scientific issue, working through it would be easy. But use of the chemical has become a political football with industry players who produce three million tons of it globally each year or add it to the packaging containing their food products squaring off against campaigners convinced it is toxic to humans and politicians who have joined their cause. 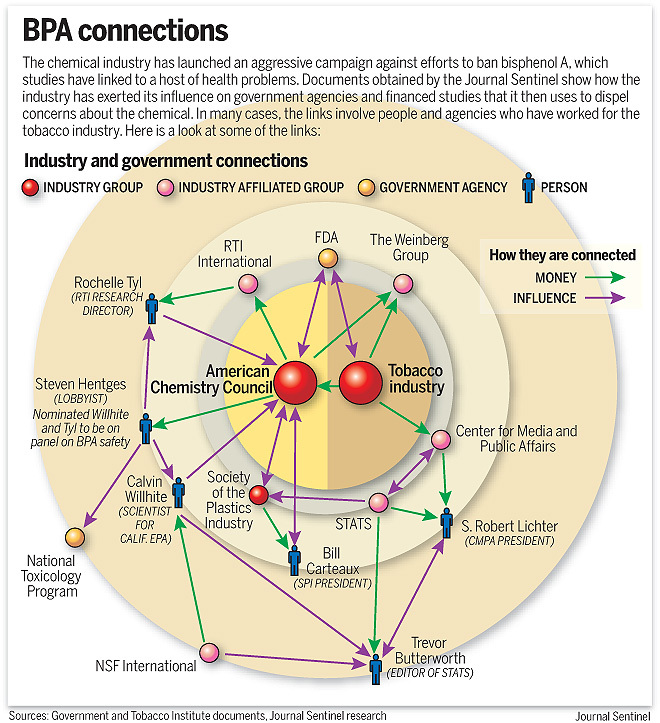 The image below, which Professor Robertson showed yesterday, suggests the industries dependent on BPA (alternatives deemed to be less problematic are more expensive) have in the US lobbied government agencies and underwritten scientific research as part of a campaign to fight a Bisphenol-A ban. What do the scientists think? Clearly, there is differing opinion among scientists on the safety of Bisphenol-A and a fairly extensive body of research that has failed to conclusively point to a risk great enough to have regulators universally moving to ban BPA. ’I don’t think we should ban BPA, but I think we should control its use much more carefully. BPA is the chemical used to manufacture polycarbonate plastics, is a component of lacquers used to line food cans, and is used in some dental fillings — the problem is that it mimics the female hormone. Small doses over a long time can initiate female hormone responses. NZFSA’s view, based on current scientific evidence, is that there is no health concern associated with BPA, a chemical found in plastics, including food packaging and babies’ bottles. We are maintaining a very close watch on developments in case new data comes forward that changes this view. Products containing BPA are pervasive in the market here, though non-BPA containers are also on sale, particular when it comes to baby bottles and sippy cups. The media has taken an interest in the issue, with varying results. The New Zealand Herald went big on Bisphenol-A at the start of the year. BPA – tip of the iceberg? As the New York Times piece points out, Bisphenol-A isn’t the only endocrine-disrupting chemical being used in food packaging. Professor Robertson helpfully cycled through the other chemicals used in food packaging that may be interacting with food with largely unknown consequences. There’s diisopropylnaphthalenes (DIPNs), chemicals from recycled paper, used for board in food packaging, may migrate into food. Then there’s the packaging chemical ITX, which isn’t on food regulators’ risk lists but is raising concerns nonetheless. There’s also concern that inks used in food packaging labels may leach into food, in some cases being absorbed through plastic containers, with potentially negative consequences. Professor Robertson’s presentation was fairly open-ended – the lack of scientific knowledge about these chemicals from the likes of Nestle and Tetra-Pak, major users of food packaging, concerns him. But like the scientists attempting to examine the concerns of BPA’s vocal critics, he isn’t able to make a call one way or other as to the safety of BPA. “They do have a point, but the effect in humans is still questionable,” he said today. One worrying issue he raises, is that traceability in the food industry – the ability to track where products and their packaging have come from, is getting more difficult to follow when technology should be making it easier. He puts that down to the increasingly global sourcing of food packaging materials. Country of origin labelling for food is patchy, let alone the packaging the food comes in. A lack of robustness in packaging compliance warranty schemes around the world doesn’t help. Robertson, who consults to food manufacturers, had firsthand knowledge of the difficulties of tracing food packaging materials when he was asked to trace a company’s food packaging through the company’s entire supply chain. “After three months, I gave up in defeat,” he said. In the US, where a third of BPA is produced, the debate around its safety has become highly politicised with Democrats and environmentalists vocal in their concerns about it, while industry and Republican supporters claim there is no problem with it. Last week California rejected a BPA ban. This month the European Food Safety Authority is expected to issue a long overdue update on BPA. The US Food and Drug Administration has also been reviewing its stance on BPA. The decisions these regulators make about BPA may determine its future use globally. Political pressure is no doubt encouraging regulators to make BPA a priority. The new, government-financed studies will try to determine whether BPA can play a role in obesity, diabetes, breast and prostate cancer and disorders of the developing immune, cardiovascular and nervous systems. Dr. Birnbaum said researchers would be looking for effects on learning and behavior, and also trying to find out whether there are ’multigenerational’ effects, meaning that exposure in a pregnant animal can affect her offspring and the next generations as well. In the meantime BPA is, in most countries, considered safe and remains an integral ingredient in food packaging most of us come into contact with. But with a host of chemicals added to food packaging and growing mistrust among consumers when it comes to food safety, the industry, science and regulators have their work cut out for them reducing uncertainty in the BPA debate. Humans are exposed to small amounts of numerous naturally occurring xenoestrogens in the diet, such as phytoestrogens and zearalenone, but ingesting small doses, in themselve insufficient to have any endocrine effect, over time does not mean that one day you will wake up with hyperestrogenism. So why on earth would this be the case for a rapidly excreted xenobiotic such as BPA? Perhaps if exposure was reoccurring – say continuously using the same type of BPA containing bottle or toy – there would be enough exposure to cause problems? How long is it before BPA becomes completely protein bound? Is there enough time for it to have an effect before becoming protein bound? 6 hours is a reasonable amount of time – it all depends on how much of this time the BPA can interact with the oestrogen receptors. Ah, now I CAN post. Note that the EFSA summary shows that most BPA taken orally is glucoronidated in the gut wall or on first pass through the liver, so it is never available to oestrogen receptors at all. Then, only 5% that reaches the circulation without glucuronidation is not protein-bound. The ratio of protein-bound to free is an equilibrium reaction so is maintained even in the face of a bolus of free BPA being added. Protein-binding is typically very rapid; after all there is a lot of protein in the liver and the circulation. 6 hours is not a long time at all in terms of maintaining a steady state, let alone acheiving accumulation as Ian Shaw implies. I’ve speant years in drug development and I can assure you of that. In short, the idea that “small doses over a long time” could somehow add up to overt hyperoestrogenism one day is implausible and goes against everything we know about endocrinology, toxicology and pharmacokinetics. It would only happen if BPA were a persistent xenobiotic like the chlorinated hydrocarbons, with a very long half-life in the body, and it is not. rosalind, I didn’t post your comment because I didn’t receive it – the last one I see from you in the system before the one above was Sept 17 quoting Ian Shaw. Feel free to send it through. Thanks for answering those questions, I appreciate the clarifications. I will try and read the at some stage. Off hand, do you know what the equilibrium constant is between the protein bound and free BPA is? I don’t know the equilibrium constant between the protein-bound and free BPA is offhand. It may be in one or more of the references to the full EFSA report. There are a few others available that show that BPA is very rapidly metabolized and excreted in humans. The rapid glucuronidation is probably even more important than the protein-binding in terms of making BPA unavailable to oestrogen receptors. The enterohepatic cycling of BPA that occurs in rodents does not appear to occur in primates. Rodents excrete some BPA-glucuronide by the biliary route, and the glucuronidation is reversed by gut bacteria releasing free BPA for reabsorption. Primates, in contrast, appear to excrete all the BPA-glucuronide by the urinary route. Therefore Ian Shaw’s claim that small doses could eventually add up to an oestrogenic effect over time is unfounded. BPA simply doesn’t persist or accumulate in humans as do, say, chlorinated hydrocarbons or lead. It should be recognized that much of the work done on BPA was done in rodents and furthermore was done by injecting the BPA rather than administering it orally, resulting in a much greater exposure to free BPA (bypassing the enteric and hepatic glucuronidation). Worse, much of the work was done, and promoted, by an academic who is on record as saying she can’t see why it would make a difference how the BPA was administered!!! rosalind…I would be curious to see if you could uphold this same point with all of the recent data. I am even more curious as to why you would want to. Griffin's Gadgets is the blog of Sciblogs founder and editor Peter Griffin. His area of interests include technology, science, futurism and science communication. 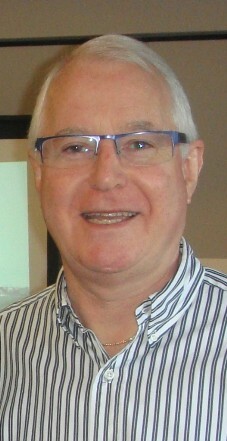 Peter is the founding director of the New Zealand Science Media Centre and a technology commentator for the New Zealand Listener, Radio New Zealand and Newstalk ZB.